Updated February 2019. Originally posted May 2016. Luke Milliron, UCCE Farm Advisor, Butte, Tehama & Glenn Counties; Richard P. Buchner, UCCE Farm Advisor Emeritus, Tehama County; and Steve E. Lindow, Professor of Plant Pathology, UC Berkeley. Depending upon weather conditions, pathogen population and walnut variety, walnut blight caused by the bacterium Xanthomonas arboricola pv. juglandis (Xaj) can cause significant crop loss. 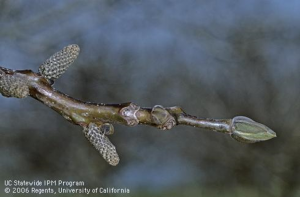 Xaj overwinters, nestled inside dormant bud scales, and initially causes infection in spring when bacteria are rain splashed onto developing shoots and walnut flowers (photo 1). Blight damage in later leafing varieties largely depends on how high the overwintering population of inoculum built up on bud scales. Initial inoculum in dormant buds can be used to predict subsequent disease severity. Photo 1. Inoculum of the Xaj bacteria overwinters in dormant buds and infects developing walnut shoots and flowers via rain-splash (photo by Richard P. Buchner). Three things are necessary for a disease to occur: pathogen, host and favorable weather. Plant pathologists refer to this as the disease triangle. If we can reduce any leg of the triangle we can greatly favor reduced disease. We have some control over the host (late leafing varieties), no control over the weather but we can monitor the pathogen with bud population levels. This bud monitoring helps inform our management program. Why Are Some Orchards Hit Hard, Others Not? Walnut blight can go for just one cycle, causing a problem one year and not the next, or can get in a loop and build up over time. It depends in part on spring rainfall. With one cycle, spring infections don’t create more bacteria inocolum to spread later. In contrast, if spring infections lead to production of new inocolum, the disease can become more severe every year. Why some walnut blight bacteria go through one cycle and others go through many is not always clear. 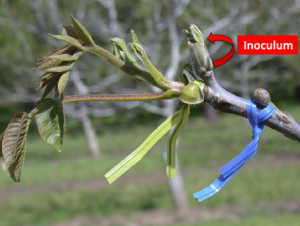 Bud population sampling can be used to measure if walnut blight populations are building or are adequately suppressed using spray applications. This is particularly useful in orchards with a history of bad blight. 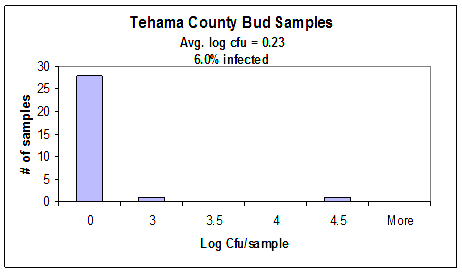 The two graphs show how bud samples can help predict future disease potential. Figure 1. Low risk orchard example. 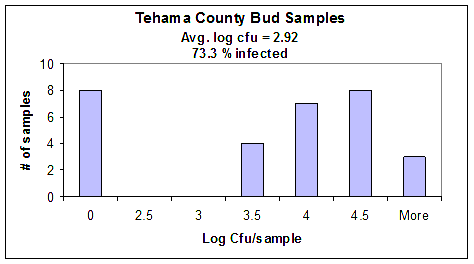 Over 25 of the 30 buds had no detectable Xaj populations and few had 3 log Cfu/sample (1,000 colony forming units) or more. Figure 2. High risk orchard example. Only 8 of the 30 buds had no detectable Xaj populations and most had 4 log Cfu/sample (10,000 colony forming units) or more. 1) Sample buds in December, January, February, March or early April for late leafing varieties. Buds can be sampled to the time they start to open. Early samples will allow more time to design disease control strategies. 2) Select 100 dormant walnut spurs with nice fat terminal buds (photo 2). Cut off about a 3 inch length. Spurs reachable from the ground are easy to collect and represent a good sample location because bacteria sprinkle down through the tree canopy. Photo 2. Dormant walnut spur with a nice fat terminal bud. Cut off about a 3-inch length for each terminal bud. 3) Walk the entire area collecting a random sample. One or two buds per tree should spread the sample adequately. Deciding how many samples to collect will depend upon experience on an orchard by orchard basis. One sample could easily represent 50 acres if experience suggests reasonable uniformity. 4) Save spurs in a paper bag and store in a cool dry place. The paper bag will allow samples to breathe and eliminate condensation. The lab will select a 30 terminal bud subsample to plate on agar and save the remaining buds as a backup sample. The results will look like Figures one and two. 5) Mail to California Seed and Plant Lab; 7877 Pleasant Grove Rd. Elverta, California 95626. You might want to phone ahead at 916-665-1581. 6) Cooperative Extension Advisors can help interpret results of pathogen assessments and discuss the relative disease risks those measurements indicate.